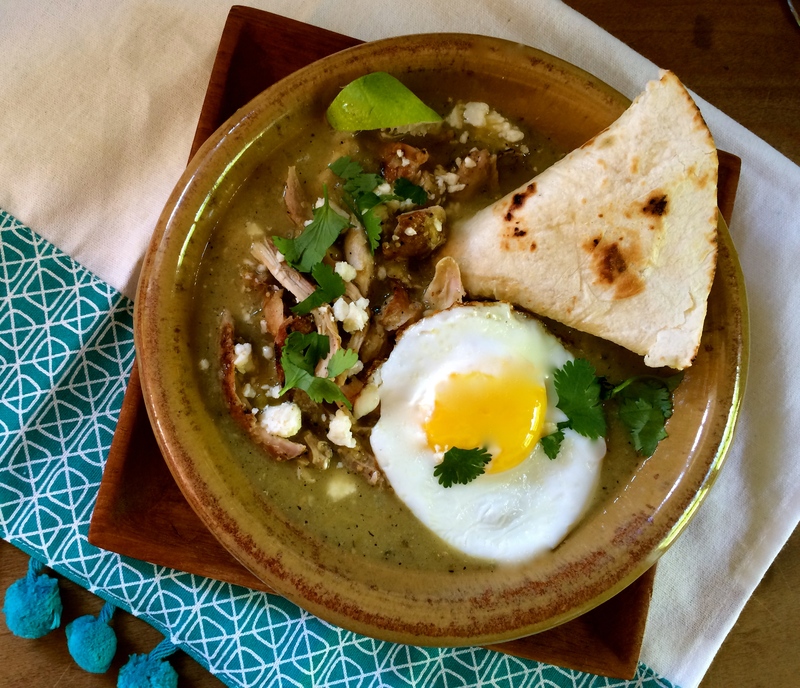 I encountered some lovely organic tomatillo’s at the market a few weeks ago and brought home more than enough to make this delightful chilaquiles verdes recipe. Turns out I ended up making two batches because it is so good! The first time around I followed a recipe I had tucked away from Food52, which involved oven roasting tomatillo’s, red onion, jalapeño and garlic until golden brown, then whizzing in a blender. The chicken was simmered in chicken stock just long enough to cook through and then shredded into tender moist bite size pieces. All of this was placed back into the dutch oven to simmer with the chicken stock and a generous amount of lime. 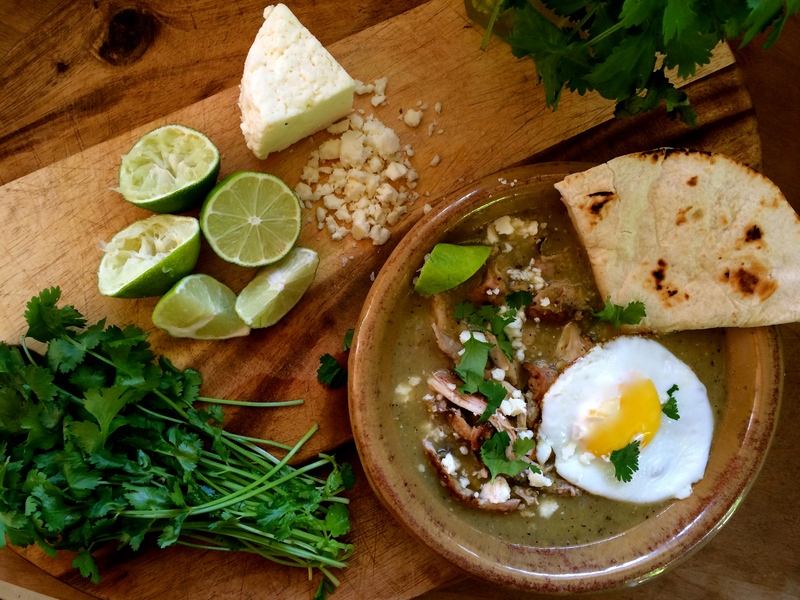 It was perfectly flavored with queso fresco, cotija, cilantro and finished with a fried egg on top. The second time preparing chilaquiles verdes our temperatures soared to 82°F (24°C) and I couldn’t imagine the oven adding heat to the already hot kitchen. At this point, I decided to grill the vegetables and chicken and after whizzing the vegetables in the blender add it the pot of chicken stock along with the shredded grilled chicken and generous amount of lime. Turned out to be an interesting comparison of oven roasted vs. grilled vegetables. The fire roasted flavor from the grilled vegetables was quite nice, however, when I prepare this again rather than grill the chicken I will simmer it in the chicken stock to achieve the tender moist texture that makes chilaquiles so wonderful. The recipe below is the oven roasted vegetable version. If you are interested in the fire roasted version, grill your olive oiled vegetables for 15 minutes turning often and make sure to follow the same recipe below for the chicken. Recipe adapted from Food52 by lisina. 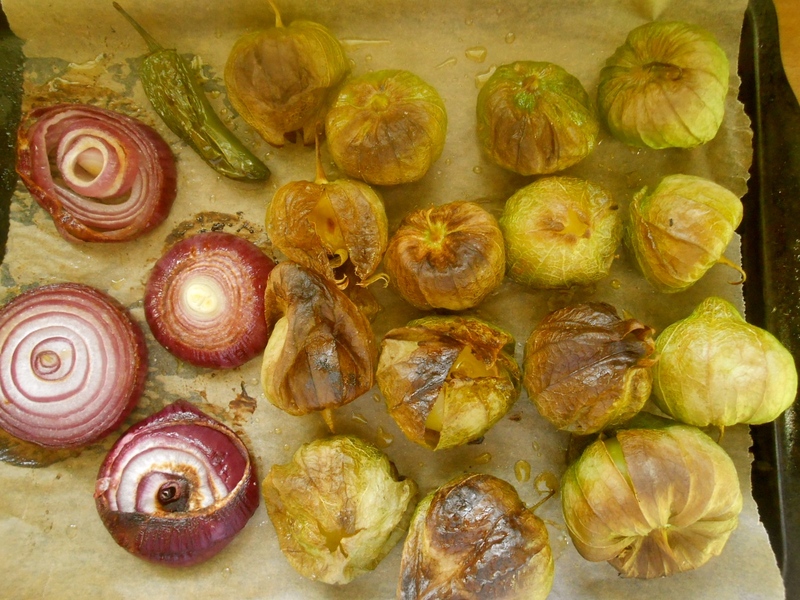 Lay tomatillos, onions, jalapeños, and garlic on a baking sheet lined with parchment paper. Drizzle with olive oil and sprinkle with salt. Place the baking sheet under the broiler, until the veggies are wilted and blistered, about 10 minutes (time will vary based on the heat of your broiler). Remove the veggies and let them cool until you are able to handle them. 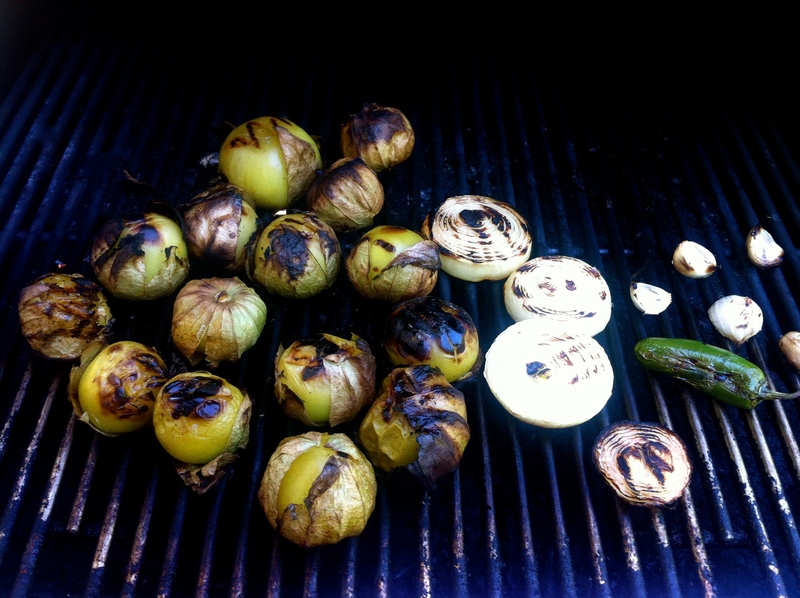 Remove the husks from the tomatillos, squeeze the garlic from the cloves, and remove the stem from the jalapeños. Throw the roasted veggies into a blender, along with any juices that accumulated on the baking tray. Add the cilantro leaves, the juice of the lime, and the crema. Purée until the mixture is very smooth. Taste and make any needed adjustments (more salt, acid, etc). While the veggies are still in the oven, bring the chicken broth to a gentle simmer in a dutch oven. Add the chicken breasts and allow them to simmer until tender, about 20 minutes. Move the chicken to a cutting board and use two forks to shred it. Return the chicken and any juices to the pot. Add the tomatillo purée to the chicken broth, taste for seasoning (note the sauce should be tangy, almost sour, so add another squeeze of lime if necessary), and bring to a simmer. Cover and let the mixture simmer for about 20 minutes. Cut the tortillas into quarters. If your tortillas are fresh, dry them out in the oven or toaster oven. If they’re stale and dried out, add them right to the pot. Stir the mixture and let simmer for another 10 minutes. The tortillas will cause the sauce to thicken. Uncover and stir in the queso fresco or sprinkle with the monterey jack. Cover the pot again, allowing the cheese to melt. Uncover, sprinkle with cotija and cilantro, and serve. A couple of weeks ago I decided it was time to get the hang of making a good pie crust. Both fruity & savory pies are at the top of of my favorites list and there is no excuse for bringing home store-bought pie crust. Crumbles, cobblers and pretty much any fruity baked dessert that doesn’t involve a combination of butter, flour, icy cold water and refrigeration for a period of time are put together with ease, but no, not pie crust. Not for me anyway. 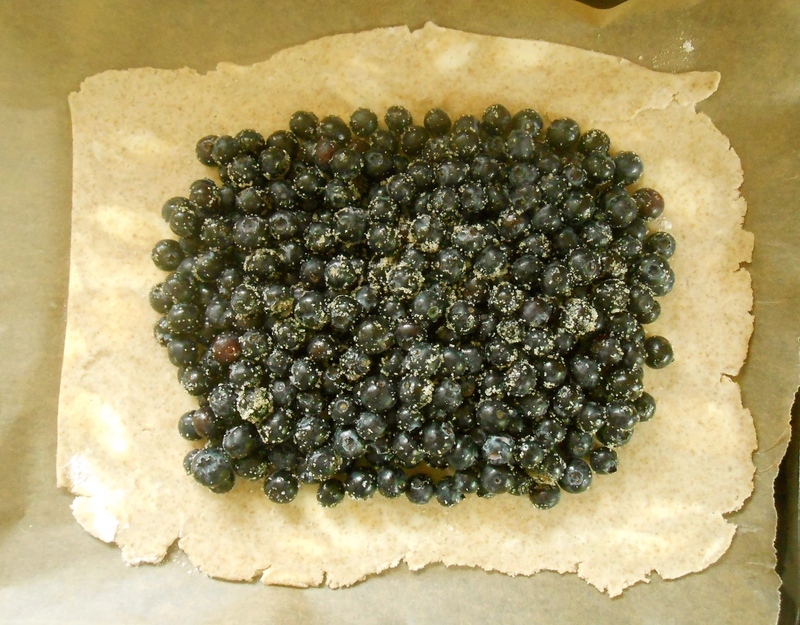 I mix my pie crust by hand and just for practice I made four pies in the past two weeks; two savory pies and two blueberry slabs. Yes, I made this slab twice in two weeks. It is that good. The slabs turned out beautifully. The crust was perfect. Flaky, buttery, it easily rolled out to a perfect thickness and it held the juices in. 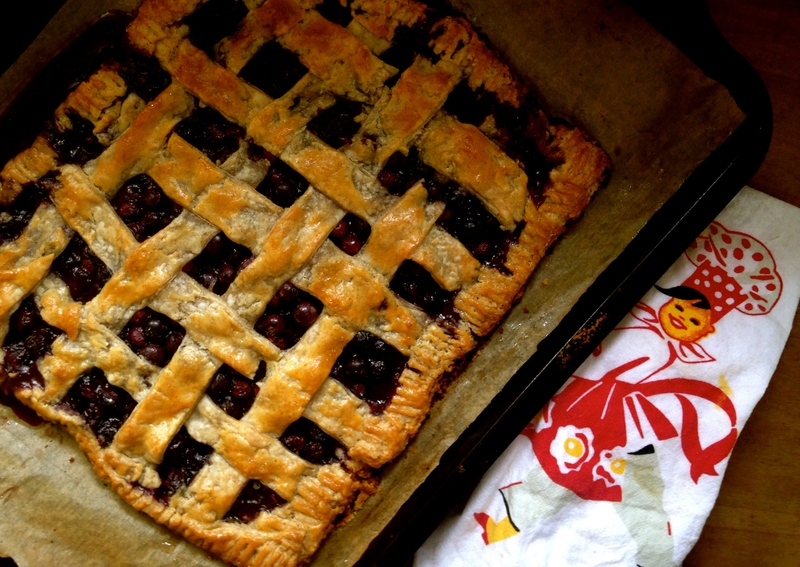 Both the rye flour and the apple cider vinegar added a twinge of sourness which contrasted well with the sweet blueberries. 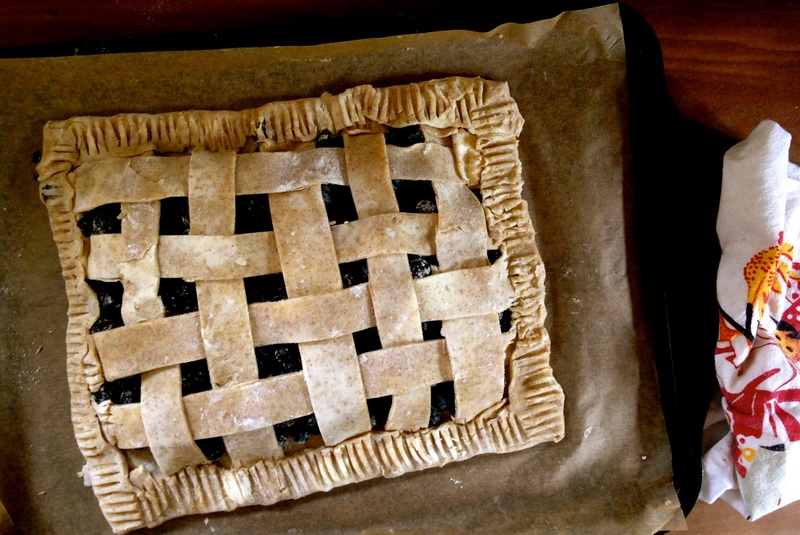 I just love a rustic looking pie. And this held together well enough to eat without using a plate or fork. 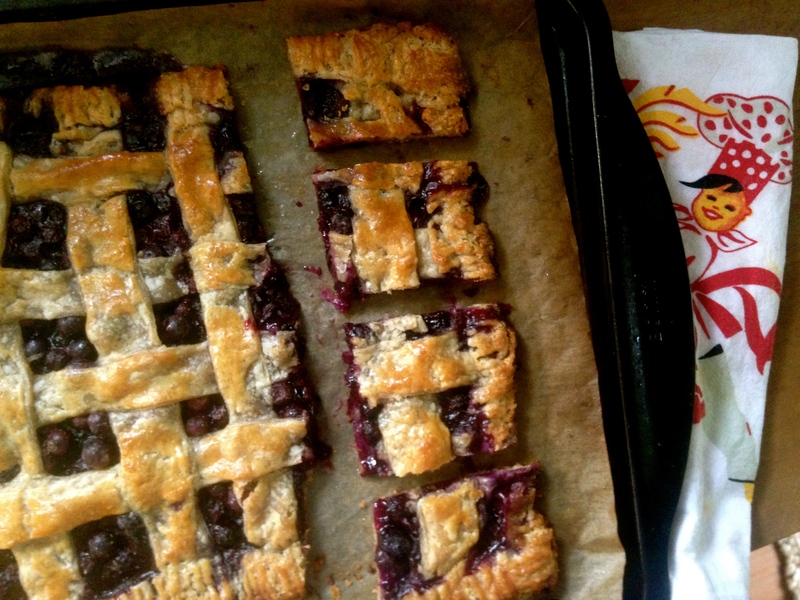 You can pick up the squares and eat them as you would a hand pie. I still need a lot of practice but this blueberry slab was simple enough for a novice pie maker. If you have any tips on making pie crust you would like to share, please do, I can use all the help I can get. I took this Food52 recipe and reworked the filling by leaving out a large amount of sugar, ginger, lemon zest, salt and flour. Recipe adapted from Food52 by Yossy Arefi. Gently toss the blueberries, sugar and vanilla bean seeds in a bowl until well combined. Put the baking sheet into the refrigerator or freezer until the crust is very firm. When you are ready to bake, brush the top of the pie with a beaten egg and generously sprinkle it with sugar. Bake the pie until the crust is deep golden brown and the juices are bubbling, 35 to 45 minutes. Cool slightly before cutting. My plan for dinner on this particular evening was to make chicken meatballs, Italian style with garlic, onion, parmesan, parsley, egg and breadcrumbs, but I couldn’t get past my craving for spicy Indian flavors. Rather than a complete dinner makeover I decided to stick with the meatball plan and change up the ingredients to include chili powder, cumin, coriander, garam masala and a jalapeño pepper. We have been discovering some interesting substitutes for glutinous ingredients and dry roasting 1/4 cup of quinoa on your stovetop and whizzing it in your spice blender or food processor will create quinoa flour and it can be used to bind your meatball’s together without using breadcrumbs. Simple clean ingredients include organic free range chicken, one egg, chili powder, cumin, coriander, garam masala, onion, cilantro, quinoa flour, ginger, garlic, jalapeño and a generous amount of salt. Most meatball recipes call for browning them in a pan and then finishing them in the oven. I only baked them. It’s great to just put them in the oven and walk away. Clean-up is also very easy, thanks to the parchment paper on the sheet pan. The resulting meatballs have a touch of jalapeño heat and exude a wonderfully spiced fragrance. 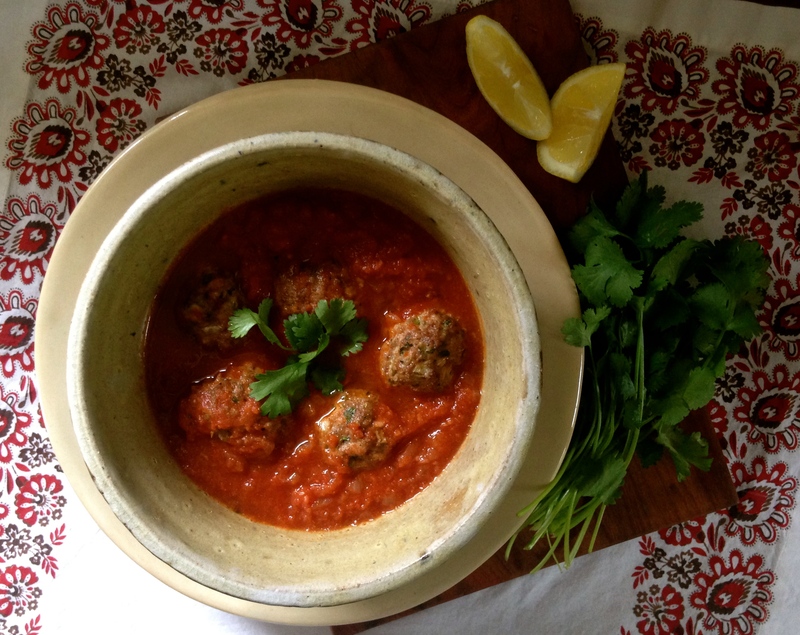 After the meatballs are nicely brown and cooked they are simmered in a spicy tomato sauce. Simmer them just long enough to absorb the sauce so they will become even more flavorful and juicy. They would be delicious with couscous, or stuffed in pita with chopped cucumber and plain yogurt or even just stacked on rice with a cool salad on the side. This recipe is inspired from several online recipes for spicy Indian style meatballs. Pre-heat the oven to 350F. 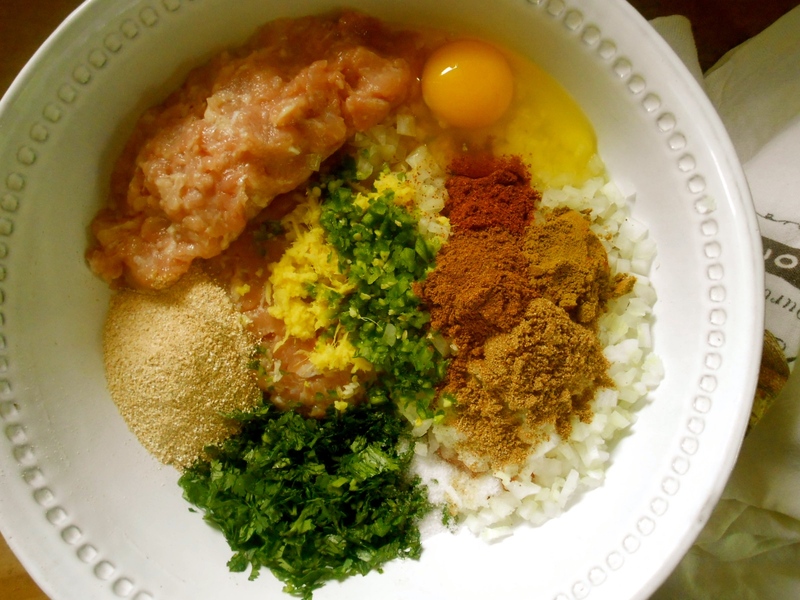 Place the ground chicken in a large bowl and add the onions, ginger, garlic, jalapeño, spices, cilantro and salt, mix well to combine. 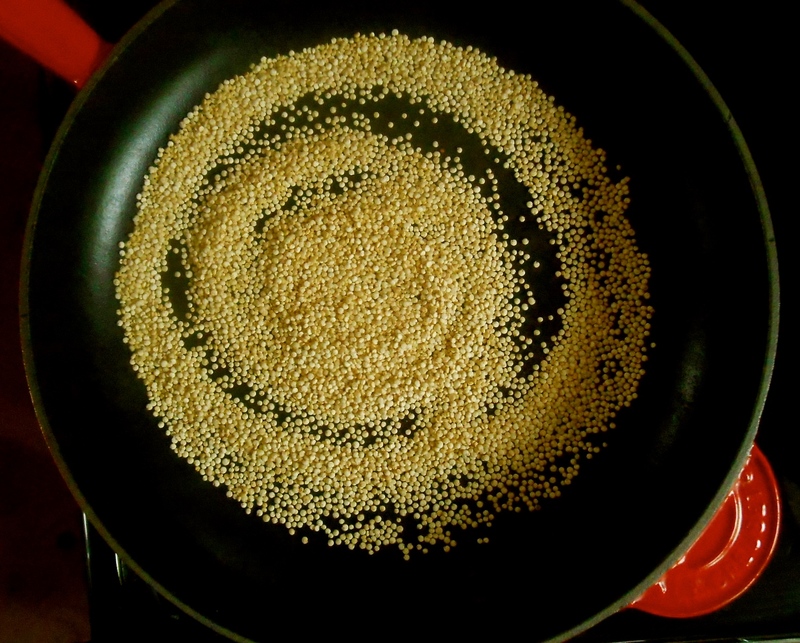 Add the beaten eggs, oil and quinoa. Mix well using your hands. 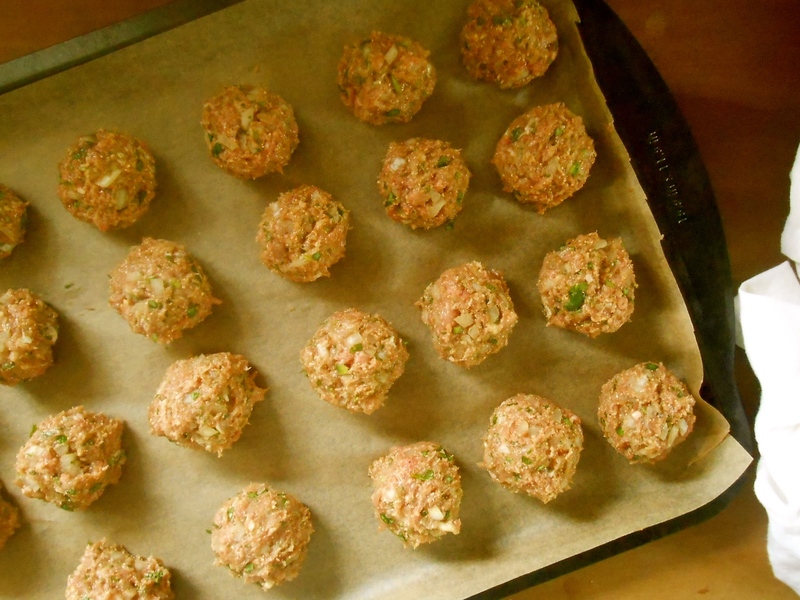 Roll into balls and place them on a parchment lined baking tray. Bake for 30 minutes until they turn golden brown on the outside. Remove and let them rest. While the meatballs are baking make the sauce. Heat oil in a large pot. Add the onions and little salt and allow them to cook until translucent. Add the ginger and garlic and sauté for 2 minutes. Stir in the tomato puree and add the spices and cook for 20 minutes. If sauce is too thick add a little hot water to thin. Add cilantro and baked meat balls. Simmer for another 10 minutes allowing the meatballs to absorb the sauce. A very similar pasta recipe was posted here several months ago and the only difference between the two is the type of pasta used. We have been using quinoa pasta as of late and honestly I really love both the texture and flavor of the noodles. I have tried a couple of different quinoa products and the best, in my opinion, is a corn free brand called Andean Dream, which is made with only two ingredients, organic quinoa flour and organic rice flour. It may seem a bit odd to use yogurt in a pasta sauce but it really works here. The overall effect is a tad sour and creamy but not heavy. And with pea harvest in full swing (at the co-op) now is the time to make as many pea recipes as you can during this short lived season. This is a wonderfully light springtime dinner. Adapted slightly from Jerusalem, by Yotam Ottolenghi and Sami Tamimi The original version of this recipe calls for conchiglie or shell-shaped pasta, but you could use any pasta shape you like. If you’re worried about the amount of heat, consider starting with a little less chili than what is called for – or lightly drizzle the chili oil on your pasta. In the bowl of a food processor, combine the yogurt, 6 tablespoons (90 ml) of the olive oil, the garlic, and 2/3 cup (100 g) of the peas. Process to a uniform pale green sauce, and transfer to a large mixing bowl. Bring a large pot of water to a boil, and salt it until tastes like pleasantly salty seawater. Add the pasta, and cook until it is al dente. While the pasta cooks, warm the remaining olive oil in a small frying pan over medium heat. Add the pine nuts and chile flakes, and cook for 4 minutes, or until the pine nuts are golden and the oil is deep red. Also, warm the remaining peas in some boiling water (you could scoop out a bit of the pasta water for this); then drain. Drain the cooked pasta into a colander, and shake it well to get rid of excess water that may have settled into the pasta’s crevices. Add the pasta gradually to the yogurt sauce; adding it all at once may cause the yogurt to separate. Add the warm peas, the basil, feta, and 1 teaspoon kosher salt. Toss gently. 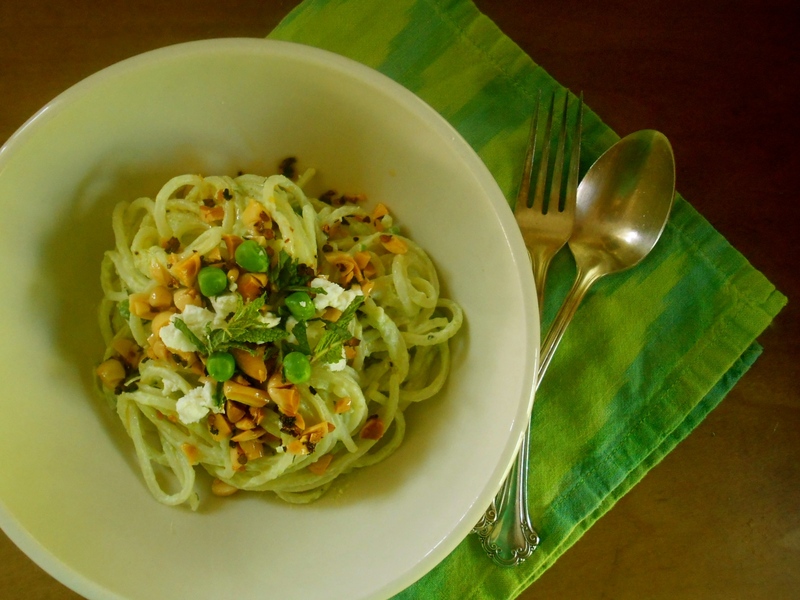 Serve immediately, with pine nuts and chile oil spooned over each serving. Serves 4, generously. This soup transpired from of a conversation in the comment section on my sautéed mushroom post a few weeks ago. The conversation with Johnny went like this: “That’s how I like my mushrooms. In fact, to make soup I then just add organic vegetable stock and blitz, add a little cream, adjust the seasoning and viola! 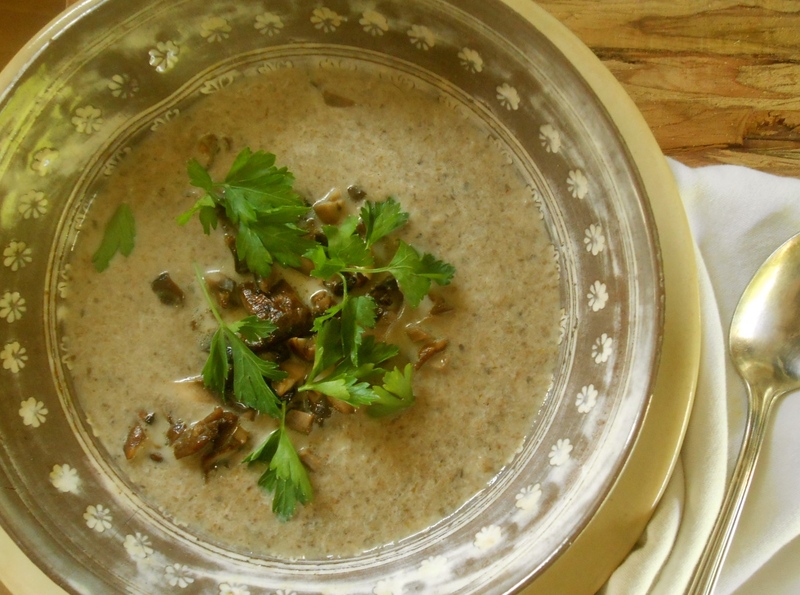 So simple.” I responded: “I had no idea mushroom soup could be so easy! I’m surely going to make some.” And I did. The conversation went on a bit and Johnny left clear and concise suggestions for this delicious mushroom soup. This comment conversation brought me to realize how much I enjoy blogging and corresponding with so many wonderfully inspiring individuals around the world who have a love for cooking. It’s lovely to know that there are a number of like minded folks out there, so spirited about what they are creating in their kitchens and preparing delicious meals for themselves, friends and family. Posting is fun and I really enjoy the process of taking photographs and hoping they turn out. But what I’m really fond of is the lovely correspondence with all of my readers. We were delighted with the soup. The ease of putting it together, the lush creamy consistency and it’s pure mushroomy goodness are what makes this a perfect soup on a cool, cloudy, misty day. Heat the butter and 2 tablespoons olive oil in a sauté pan over medium heat. 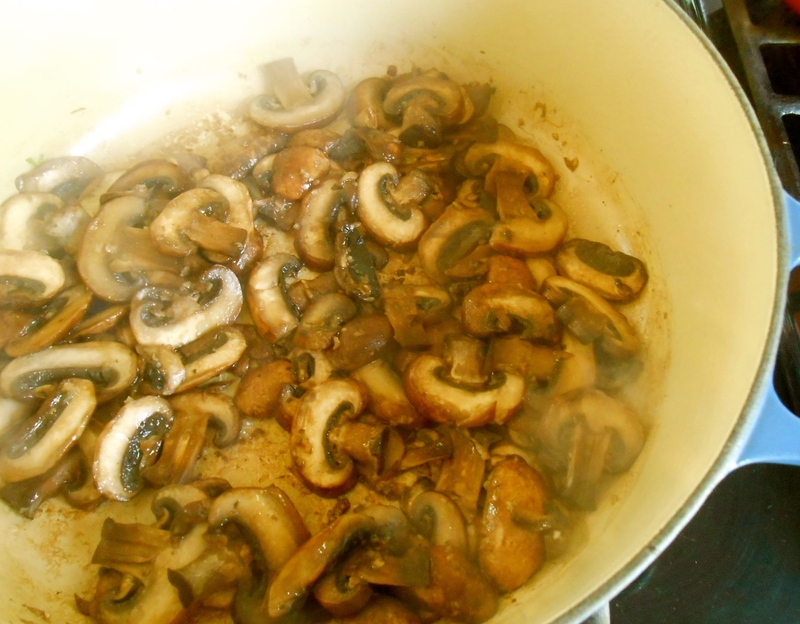 When the butter’s foaming, add the mushrooms and coat well. Allowing them to sit in the pan for the first 5 minutes to brown, and then stir occasionally until they soften. If you are using wine add it now and allow the liquid to evaporate. Stir in the garlic and parsley (or thyme) and continue to cook for 30 minutes on low heat until caramelized. In the meantime, place a soup pot over low heat. Stir 2 tablespoons olive oil and flour together in the pot and heat until it bubbles slightly. Add stock, bay leaf, a pinch of red pepper flakes and bring to nearly boiling. 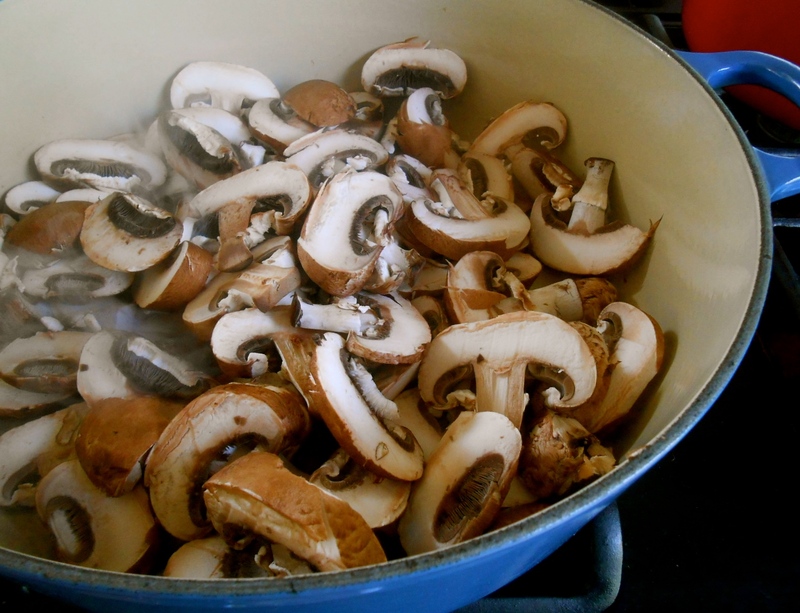 When the mushrooms are cooked and caramelized add them to the stock (optional: put a few mushrooms aside for garnish) remove the bay leaf and blitz with a hand held blender. If you don’t own a hand blender you may use a regular blender and work in small batches. Taste for seasoning and stir in a little cream. Garnish with mushrooms and parsley. I’m easily over-stimulated in large department stores, especially ones that involve home & kitchen products. I find it difficult to concentrate and I end up spending way too much time walking the isles in sensory overload. But on this visit I was on a mission. I needed to find a spiralizer and I knew BB&B would have one. And sure enough. I found this kitchen tool. A spiralizer. After paying for it I headed over to the co-op and picked up 3 medium sized organic zucchini. 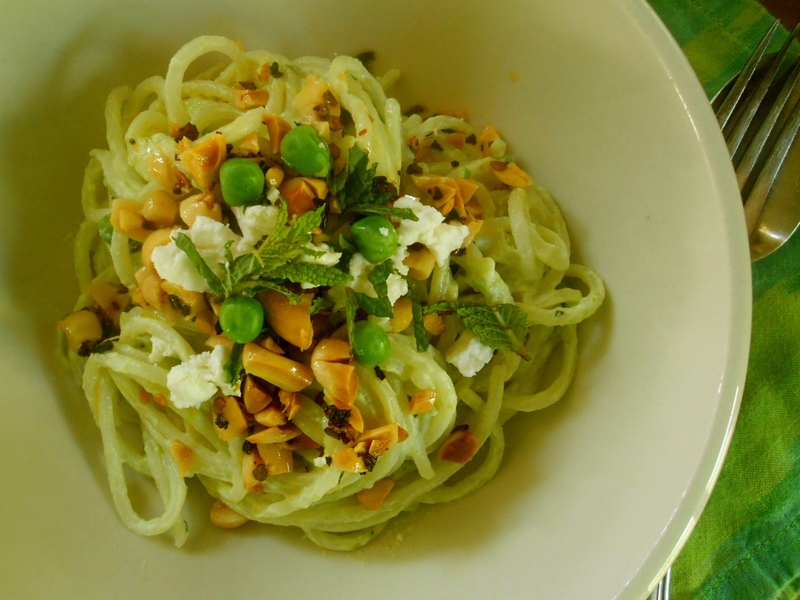 My plan for the day was to prepare zucchini noodles for dinner and toss them in my favorite parsley pesto. I am not a kitchen gadget & tool person. If you can believe it I don’t own a blender, food processor (it stopped working), Kitchenmaid mixer, slow cooker or microwave (well, we have one but it’s in the basement). I guess you could call it an ill equipped kitchen, but we get along just fine. However, this gadget…the spiralizer is something I have grown very fond of. It creates beautiful strings of vegetables. You can even twirl your freshly spiraled vegetables around your fork and have the same wonderful sensation that only spaghetti can satisfy. It’s a hot item and most likely considered a trend, but I am convinced it is a nice alternative to enjoy a bowl full of delicious healthy noodle-like textured vegetables similar to semolina pasta. 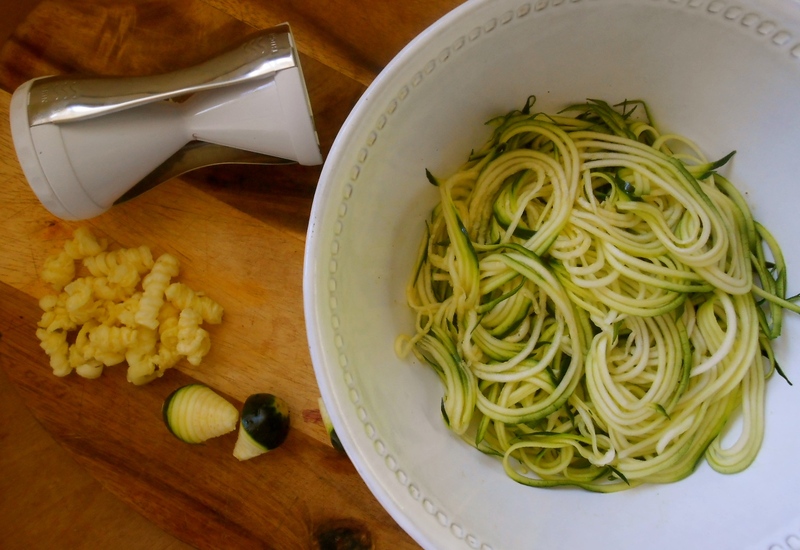 If you are unable to obtain a spiralizer you can achieve the same wonderful pasta like “noodle” by using a vegetable peeler and shaving your zucchini into thin ribbony Pappardelle. If you don’t own a food processor finely chop parsley, garlic and pecans. Combine with olive oil, parmesan and chili flakes. 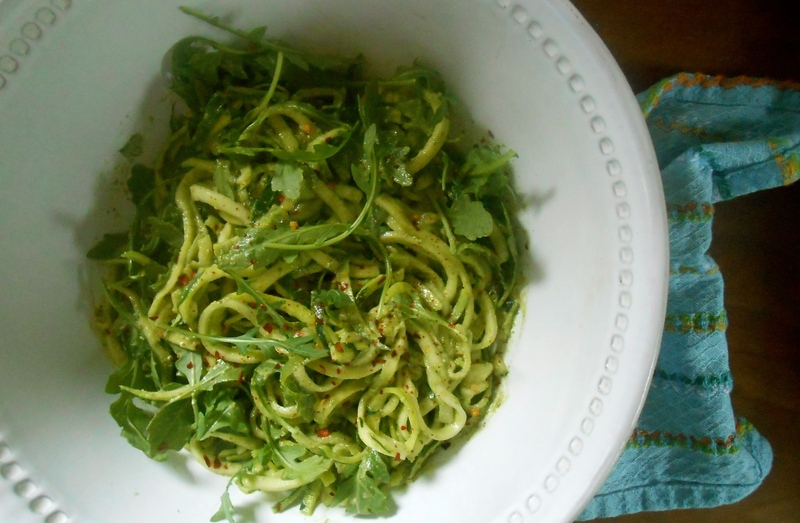 Toss zucchini, arugula and pesto in a large bowl. Taste and add a little more parmesan and / or salt to your liking. If you own a food processor…place the parsley, parmesan, garlic, pecans and salt in a food processor and pulse for a few seconds to combine. Scrape down the sides of the bowl, then pulse again. Drizzle in the olive oil while the machine is running just long enough to incorporate the oil. 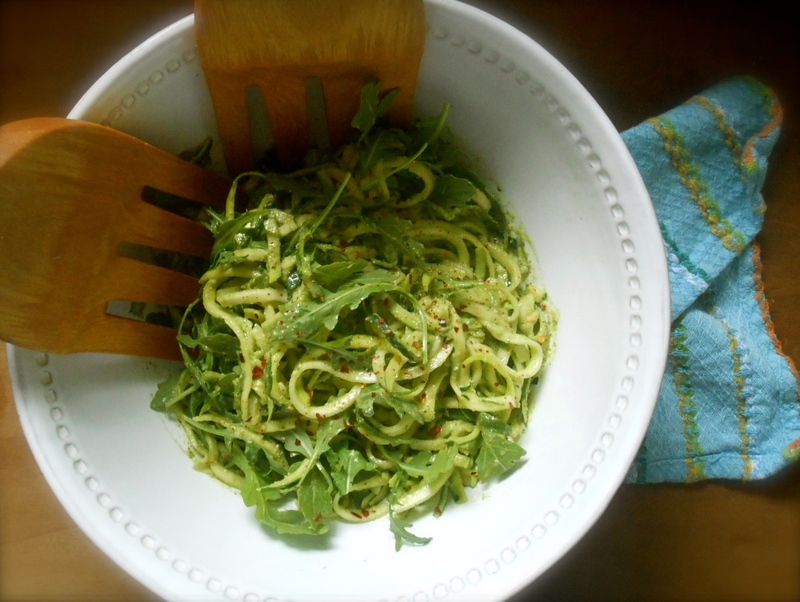 Toss zucchini, arugula and pesto in a large bowl. Taste and add a little more parmesan and / or salt to your liking. 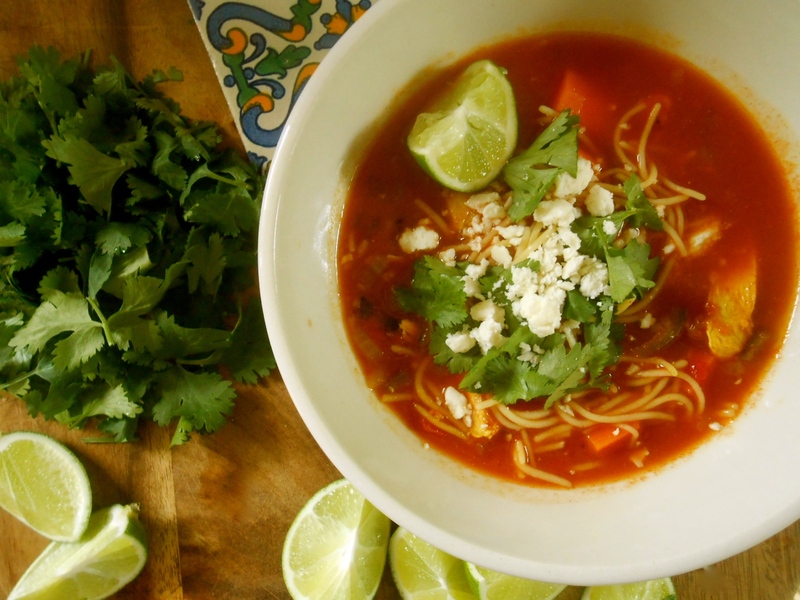 Incredible wonderful Mexican soup. I found this recipe while scrolling through photographs on Food52 and just in time for Cinco de Mayo. 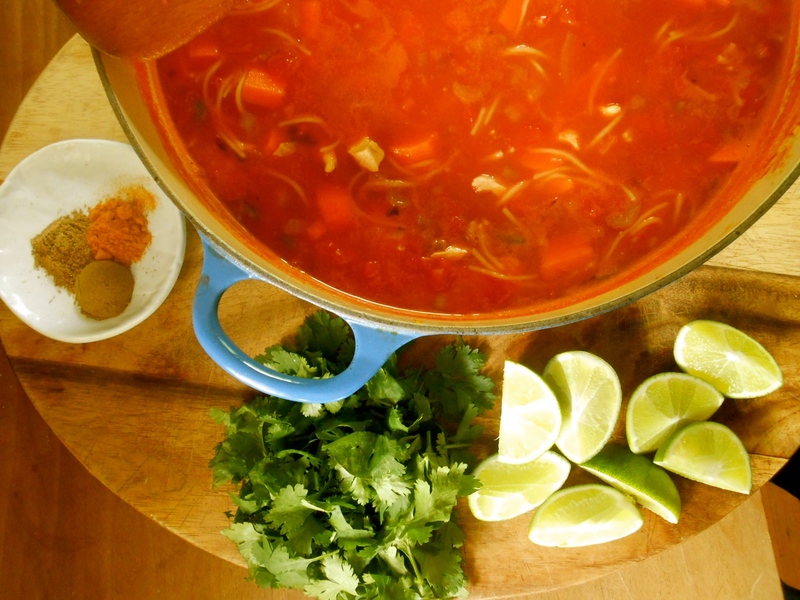 It’s a matter of fact we cooked two different Mexican soups this week and I will be sharing the other one soon. Once again I am preoccupied and slightly obsessed with Mexican food. 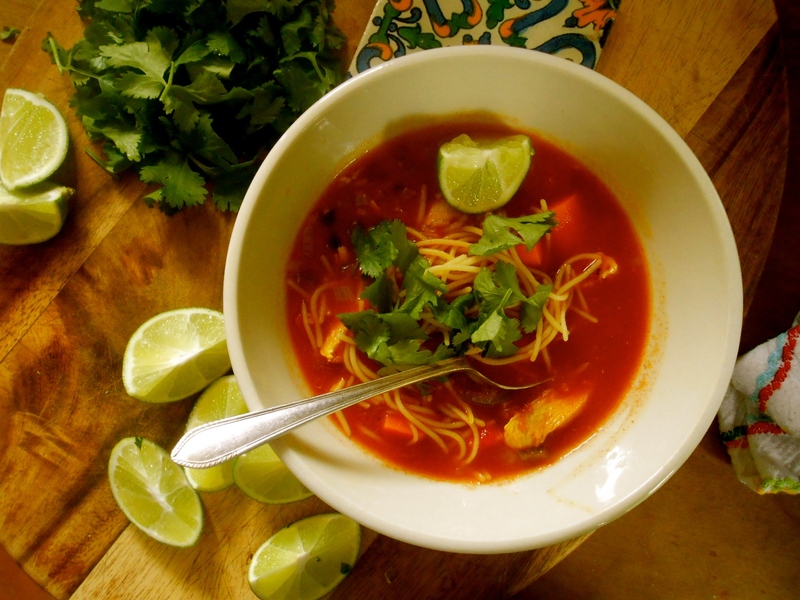 We have a tendency to get on this kick once or twice a year and it usually involves spicy soups, enchiladas, molé and various other spicy latin influenced foods. This is such an invigorating soup. A bit spicy, but not too much. It’s very simple to put together once you have the ingredients prepped and ready to go. The recipe calls for the seeds to be remove from one jalapeño pepper but we removed only 1/2 the seeds to allow a little more heat, feel free to keep them all if you like it hot. The heat was just enough to linger for a moment until the next spirituous bite. Quinoa pasta may be used to keep it gluten free. If you do so we found it was best to pre-cook the quinoa pasta and rinse before adding to the soup just to prevent too much starch in the broth. Oh, and the three of us finished the whole pot of soup in one sitting. Yes, it’s delicious. In dutch oven or soup pot, heat oil on medium heat and add onion, celery, carrots until onions are translucent. Add chopped garlic and jalapeño and stir about one more minute. Add tomatoes and stock and chicken and bring to boil. Once chicken is cooked, remove from pot, let cool and shred. Simmer on low heat and put chicken in pot and add noodles (pre-cooked and rinsed if using quinoa pasta), dry spices (salt, pepper, coriander, turmeric and cumin) and juice from two limes. Keep on low heat or remove from heat when noodles are cooked, about 5 minutes. Serve with cilantro leaves, slices of lime and crumbled cotija cheese. You are currently browsing the kitchen category at COTTAGE GROVE HOUSE.